Back in June 2018, Ffion made history by becoming the first ever Welsh women’s Brazilian Jiu Jitsu (BJJ) champion in the Brown Belt division. 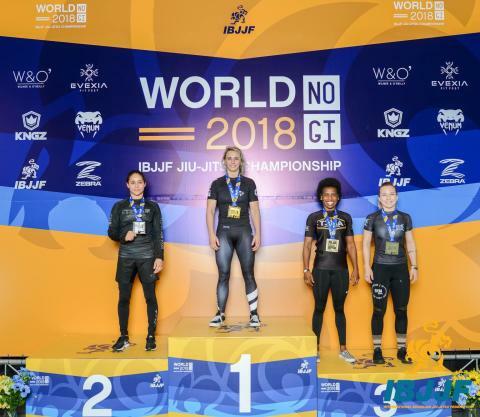 This time, just a few weeks after being promoted to Black Belt, she once again took on the best in the world to become the UK’s first adult Black Belt No Gi World Champion. She won her first two fights by submission and beat her final opponent, Brazilian athlete Amanda Monteiro, by 7 points to 0 in the final. Although relatively new to the UK, Brazilian Jiu Jitsu is one of the fastest growing sports with over 40,000 people (adults and juniors) regularly training in gyms across the country. It is a combat sport that focuses on grappling on the ground. It is suitable for all ages, both male and female. The governing body is the UKBJJA (http://www.ukbjja.org), which offers insurance, a club directory and a national ranking system for both adult and junior athletes. A key aim is to increase participation from female athletes, through an initiative called Unstoppable Girl and community and schools outreach programmes.